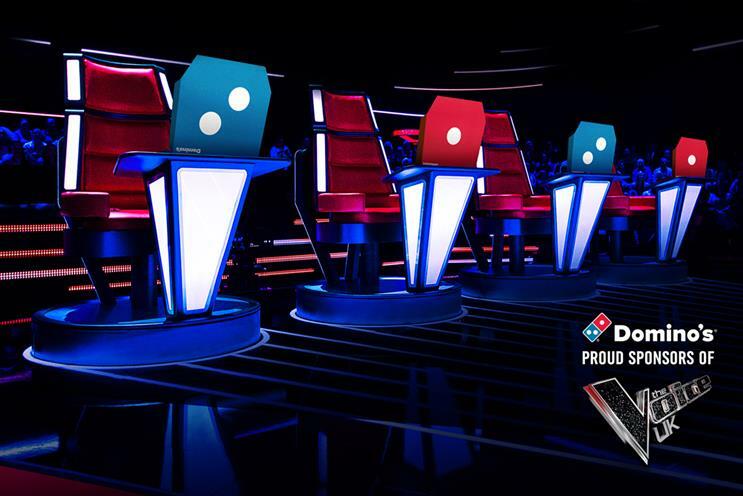 Domino's will sponsor singing talent show The Voice when it moves to ITV in January. ITV won the rights to show The Voice for three years last November. The show has been on BBC One since it launched in 2012, with the fifth series airing between January and April this year. The sponsorship package, which was brokered by Domino's media agency Arena Media, includes animated idents created by Iris, brand exposure on ITV Hub, and headline sponsor status on the show’s mobile companion app. The TV idents are designed to draw a parallel between the creation of pizza and music, with each pizza ingredient corresponding with a specific sound, which come together to form a composition. The Voice has been among the most viewed shows on UK television, with each of the five series so far attracting an average audience of between 6.5 million and 8.5 million viewers. The most recent series, however, saw a 24% dip in viewer numbers from the previous year. ITV will hope that the return to the show of Tom Jones will help to reverse this decline. Jones was one of four coaches for the first four series, but left the show last year. Jones is joined by Will.i.am, who returns for the sixth consecutive year, and newcomers Jennifer Hudson and Gavin Rossdale. Emma Willis will return as host. Tony Holdway, Domino’s sales and marketing director, commented: "The Voice offered us an ideal opportunity to align ourselves with ITV’s fresh approach to the show when it moves to its new home in January. "We hope to enhance viewers’ weekend entertainment with our freshly handmade-to-order pizzas using quality ingredients whilst they enjoy the drama and excitement that only The Voice can bring."